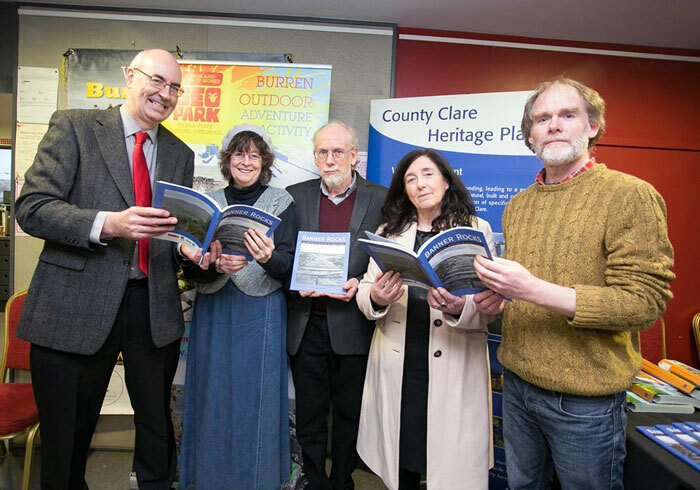 A new book on the geology of County Clare was launched at the Burren Tourism Story event at the Pavillion, Lisdoonvarna on March 6th 2015. 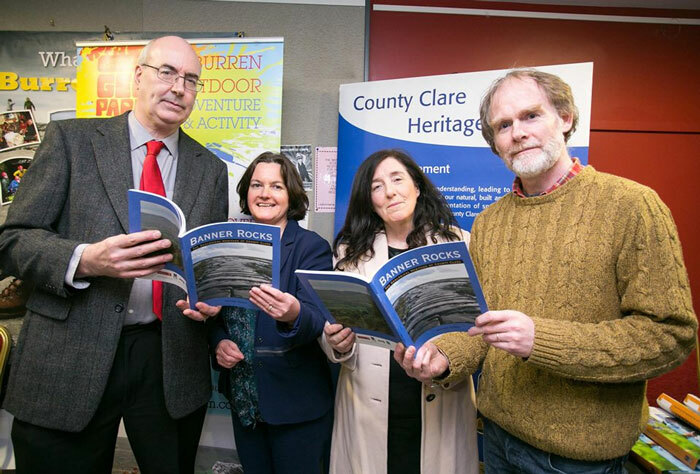 ‘Banner Rocks – The Geological Heritage of County Clare’’, which is based on a 2004 survey of Clare’s geological sites, was officially launched by Cllr. 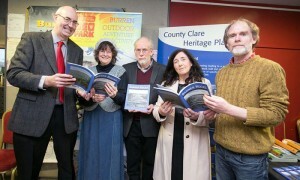 John Crowe, Cathaoirleach of Clare County Council and Dr. Fidelma Millane, member of the Board of The Heritage Council. Banner Rocks is funded by Clare County Council, The Heritage Council, Burren and Cliffs of Moher Geopark and the GSI. In the book, Dr. Matthew Parkes of the Natural History Museum explains how West Clare is one of the few locations in the world where the oil industry can survey surface rock identical in composition to the rock found on the Gulf of Mexico seabed, under which there is believed to be potentially 48 billion barrels of undiscovered oil. Hundreds of industrial and academic researchers are sent to Clare each year to conduct pre-drilling survey work in an effort to reduce the $300 million costs of an average deep water well. 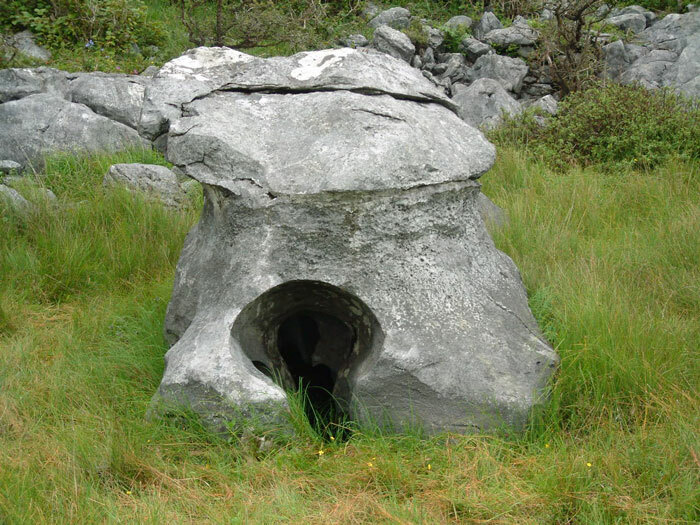 Insight into some of the other world-famous geological features that define the County Clare landscape are also featured in ‘Banner Rocks’, including the Carran Depression – the largest karstic enclosed depression to be found anywhere in Ireland and Britain. The Carran Depression is located between Corofin and Ballyvaughan and is 4.5km in area and 40m deep. Also featured is Clare’s rich representation of mushroom rocks or mushroom stones, of which there are only 70 known examples in Ireland. While previously thought to have been formed by former lakes, Dr. Parkes suggests their unique shape may have been caused by acid soils or acid bogs that have since been removed or which have shrunk away.